Last April, an article entitled "Dance Music Then and Now, from Tom Moulton to Unai ran in The New York Times. The pieces author, music critic Kalefa Sannah, did what music critics will routinely do: He brought together two recent releases for review under the auspices of thematic unity. Soul Jazz had just released A Tom Moulton Mix, an immaculate two-disc retrospective of legendary disco pioneer Tom Moultons remix work. For its part, after a two-year hiatus, the resurrected Forcetracks label was marking its re-entry into the contemporary house scene with A Love Moderne, a surprisingly good vocal house album by Swedish producer Unai. With these two records, Sannah was able to paint a brief portrait of dance music that ran four decades deep. Sannah couldnt have had a better contender for a starting point. Tom Moulton was a formidable force in the development of dance music. He was one of the first producers responsible for remixing soul and funk records for the burgeoning discos of the early and mid-70s, and he was the first producer to press one of these remixes onto a twelve-inch record. In essence, Moulton was one of the first people to produce records expressly for the social context of dancing. In light of the current house scene  the most attributable descendent of that disco era  one could argue that Tom Moulton introduced several other elements to dance music that have since mutated into an underlying ethos of conservatism. In reshaping music expressly for the discos, Moulton introduced a musical genre that was intended for consumption in specific situations: the nightclub. As a result, to this day few other genres are as limited by their listening environment as house music. Looking over Moultons shoulder at the next 30 years, its tempting to think that minimalisms credo of reduction and repetition has been  and will continue to be  the foremost marker of progress in dance music. Todays house music is still obsessed with advancements toward, and regressions from, the minimalist design. It certainly wasnt his main intention, but Moultons winning combination of nightclubs, reduction, and repetition shifted the balance of power away from the creators of the music to those who played their records. In todays house music, the DJ is often the only recognisable feature of a DJ mix. The DJ is certainly the only person seen  and often credited  by dancers. The DJ controls todays house music. Without the DJ, house musics most reliable entry point into many of our homes  the DJ mix CD  wouldnt exist. Apart from the connoisseurs ear for sonic signatures, the average house producer is unrecognisable. That is why some of the genres biggest names are all singing the same refrain: kill the DJ. The current state of dance music makes me wonder if Sannahs specific trajectory from Tom Moulton to Unai isnt missing a step. These days, theres an unofficial sentiment that the progressive dance community doesnt need to have its relevance confirmed by anyone else. Todays house and techno often feeds off itself. Collectives like Perlon, Traum, and the m_nus crew, considered among the most progressive fringes of dance music today, are pretty much self-perpetuating entities, deeply alienated from the world outside the nightclub, darkly anonymous, and dousing themselves in accelerants. Those chasing the minimal muse into its black hole of rhythm and texture consider it a radical gesture of musical adventurism, akin to John Cage chasing classical music all the way into silence. Even the dancing has become a paradox: the emotionless motion, a mere signifier of approval with the DJs programming. And when it works out right, you cant buy a better time. Möllers first records as Unai in the early years of this decade places him in line with other minimal disco revivalists like Daniel Wang, DJ T, and Morgan Geist. By his own accounts, he considered himself an adept practitioner of the prescribed sound, but was never able to rise above the rest of the pack. "After my first album was released, I felt that I couldnt take the abstract sound of that album much further. I just couldnt get any good ideas. I had released this twelve-inch called Loving That Lost Feeling [on Substatic] a year earlier, a minimal, anonymous and sterile track, and after that came out I got this feeling that I wanted to take things in a totally different direction than this kind of sound. Without a doubt, Erik Möller considers himself a dance musician first and foremost, albeit one who is challenging himself by pushing his records away from the restrictive mould of DJ-sponsored minimalism. The emotive drive of his lyrics lends focus to the heartrending synth stabs that shape A Love Modernes uniquely melancholic atmosphere. Its a description that could easily be attributed to Junior Boys So This is Goodbye, even though Jeremy Greenspan is arriving at neo-romantic dance music from a different angle, borrowing more from the 80s new wave of Ultravox and OMD than from soul music. 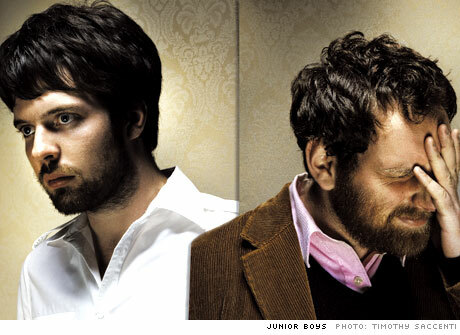 What Junior Boys have siphoned from dance music is a sense of technical capability and an intuition for the skeletal patterns that make their songs danceable, if not necessarily dance music anymore. But Greenspans allegiance to pop songwriting over dance track shaping is really a choice for creative freedom over the politics that so often shape the ethos of club culture. Kompakts Justus Köhncke certainly faced a lot of that scepticism last year upon the release of his third album, Doppelleben. His twelve-inch singles had earned him a reputation among Kompakts roster as an ace nouveau-disco revivalist, a producer with a deft touch for blending the infectious bass lines of old disco records into the reductive tendencies demanded by todays DJs. The massive success of "Timecode, his Italo-flavoured single from the summer of 2004 set the expectation that his upcoming album would deliver more of the same. But when Doppelleben went in another direction, instead opting to embrace the Germanic vocal pop of "Timecode b-side "The Answer Is Yes, much of the DJ circuit opted to ignore it; apart from any eventual remixes, there was little they could do with it. To be sure, it was inevitable that dancers would want to credit someone for the music they were dancing to. And this ascendance of a DJ persona has left a number of house and techno producers in the lurch, feeling usurped by the people not only playing their records, but also prescribing what constitutes playable at all. Among the ranks of jilted producers is one of the most progressive house acts to come along in the past decade, Sasu Ripatti, better known as Luomo. Early on in his career, Ripatti was a posterboy for anonymity: the first pressings of 2000s Vocalcity arrived completely unmarked and the name behind Luomo was kept secret. The six bottomless tracks on that album, essentially a compilation of early singles, were a mantra of reduction and repetition lasting upwards of 14 minutes, and yet they still managed to separate themselves from the pack with eerie love song vocals that complicated the deadpan, dubbed-out beats beneath them. The Present Lover, released in 2003, went even further in that contrast, pushing the dichotomy between the warmth of the lyrics and the iciness of the production to new levels. His latest, this falls Paper Tigers, maintains the sexual tension of its lyrics but complicates the beat arrangements. It certainly isnt a record for your typical DJ. Ripatti is one of the few producers who have managed to take house music beyond the clubs with any measure of success. Given the perceptions surrounding house music, its not the easiest thing to do. Perhaps no other genre is as reliant on its context as house music. "When you say house, I think of cheese music, a not-so-serious music, Ripatti says, "not something Id want to listen to at home without the clubs, without the drugs, without the girls. Its entertaining music. So I dont know how many people are willing to take house as a home-listening experience. But some people do experiment with house, like Herbert. Herbert doesnt need DJs for his music. But you do need producers who know and understand house to break that typical house cliché. In the end, perhaps subversion of house musics context  the clubs, the minimalist design, the DJ who controls it all  is the key to moving house music forward. And maybe what at first appears to be a regression into generic pop sensibilities is in fact an open display of frustration with parameters that have grown too small to support all but a few notables in an increasingly cottage industry. The question is where are these guys headed? Well, theyve already pushed the minimalist envelope as far as they care to. They all have albums that are moving away from those methods of reduction and repetition, back in the direction Tom Moultons remixes originally came from. Theyve all drenched their tracks with neo-romantic gestures: unvarnished emotion, the vulnerabilities of personality, and more recognisable semblances of song structure. One would think that, between the current calamities of laptop studios and DJ software, these guys are searching for a little soul. They may have arrived eight years apart, but both these Herbert albums managed to push the boundaries of house into uncharted terrain. Both are tour-de-force fusions of field recordings and club music. The unmistakable Chilean producer and chanteur Matias Aguayo tackles vulnerability and its undersides in ways no one else can. His was the sleazy, disarming voice behind the classic Closer Musik duo and 2005s Are You Really Lost, two albums that proved he was, if nothing else, a master of moodiness. One of Kenny Dixon Jr.s more recognisable alter egos, this 2003 Moodymann album showed the Detroit house veteran making connections back to his citys soul roots. Many fans expected Cologne producer Aksel Schaufflers 2004 debut to follow in the clubbier direction of his early singles, and so upon release this album met with its share of resistance. But two years later Here Comes Love still stands as an underrated, bravely sentimental and diverse record steeped in the romanticism of Roxy Music. Not the easiest record to find, Irish producer David Donohoes Statuesque takes an everything-but-the-kitchen sink approach to house and delivers a miasmic and emotionally magnetic experience.